Activists have remained in front of LAPD headquarters on West First Street with an encampment called #OccupyLAPD since Dec. 29 in protest of the Ezell Ford shooting. Ford’s autopsy results were released earlier on that day, prompting the group – known as #BlackLivesMatter-LA – to demand a meeting with LAPD Chief Charlie Beck to fire Sharlton Wampler and Antonio Villegas, the two officers involved in the Aug. 11, 2014, shooting of the 25-year old Ford. On Jan. 5, the protestors were forced to move their tents and other belongings by officers who cited their presence as a nuisance. The next day, Jan. 6, two women were arrested as they attempted to deliver a letter from the group formally requesting the meeting with Chief Beck. The women, Melina Abdullah and Sha Dixon, had just participated in a press conference citing their demands for action by both Chief Beck and District Attorney Jackie Lacey. They were arrested for attempting to cross barricades that had been set up at the entrances to LAPD headquarters. “They first arrested us for trespassing; it’s a public building! And they were allowing others to walk into the building, but they chose not to let us in,” said Dixon, a producer and single mother. “They changed [the charge of] trespassing to disturbing the peace; then changed it again to failure to disperse. None of those charges are accurate or true,” Dixon said. Abdullah, a professor at Cal State LA and mother of three, said the letter to Chief Beck was requesting a specific time to meet about the group’s concerns. “We wanted to meet with him at 9 a.m. on Wednesday,” said Abdullah. “We’re aware that there are procedural considerations [to firing Wampler and Villegas], but the ultimate authority rests with Chief Beck’s recommendations and we are demanding that murderous police not be left on the payroll borne by taxpayers,” Abdullah said. 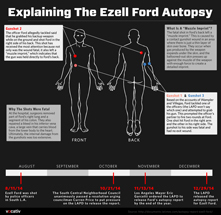 Ford’s autopsy results, released on Dec. 29th, showed he was shot once in his right arm, in his side abdomen, and in the back. The fatal wound to his back had a “muzzle imprint” – the tip of a gun barrel – on it which has been interpreted to mean the shot was at close range while he was face down. LAPD reports state that Wampler and Villegas conducted an investigate stop of Ford near his home in the area of West 65th Street and South Broadway on Aug. 11. A struggle ensued, police say, with Ford grabbing one officer and attempting to grab his gun from its holster. This prompted the other officer to fire on Ford. Eyewitnesses at the scene state Ford was laying down on the ground and not resisting when the officer shot him in the back. Media Relations Officer Rosario Herrera told the Sentinel that metal barricades in front of LAPD headquarters have been in place for a few weeks and were not placed there in response to the #OccupyLAPD encampment. “It is a public building, however if the law of no entry is being enforced, a person can be arrested for trespassing,” said Herrera. “I’m astounded that taking an act as benign as attempting to deliver a letter to a public servant would result in my arrest,” said Abdullah. “These unjust arrests will only fuel the intensity of the movement because they underscore how little our lives mean and how committed they are to silencing our voices,” Abdullah said. In addition to demanding that the LAPD fire the officers responsible for Ford’s death, the group has also demanded that charges of murder be filed against Wampler and Villegas by District Attorney Lacey. A spokesperson for the district attorney said that the LAPD is still investigating the case and has not passed it on to their office for review. “Roll out teams do parallel investigations [of officer-involved shootings] but by state law, we have to wait until police agencies complete their investigations,” said Jane Robison, public information officer for the L.A. County District Attorney. #BlackLivesMatter-Los Angeles (#BLM-LA) is the local chapter of the national Black Lives Matter movement, which describes itself as “an organization fighting to end state-sanctioned violence against Black communities throughout the world.” The group originated in protests after the killer of Trayvon Martin, George Zimmerman, was acquitted in 2013. The organization gained greater visibility during protests following the failure of local grand juries to indict police officers for the deaths of Eric Garner in Long Island, NY and Mike Brown in Ferguson, MO. Meanwhile, members of the group have remained in front of LAPD headquarters overnight and say they will continue to camp out there until justice is received.